New to cycling in and around Haringey? There’s plenty of information on Haringey Council’s website – we’ll update this section with our own views on cycling in the area. Printed cycle route maps covering all of London are available for free from TfL – two of these both include all of Haringey: guide number 4, which also covers areas to the east & west of the borough; and guide number 14, which covers areas to the south into central London. British Cycling’s ‘Go Skyride’ programme runs in Haringey, check the website for details of any upcoming rides. The Haringey Cycling Club is a youth development club based in Wood Green, for 11 years upwards, with regular Sunday rides. Finsbury Park Cycling Club established in 1883, with weekly club runs out into the Hertfordshire countryside. The club members also take part in Time Trials and have a yearly ‘Hill Climb’ event on Essendon Hill. 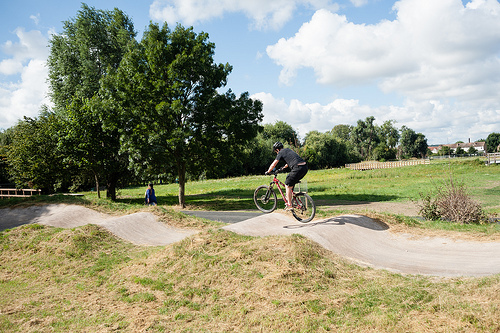 The Trax off-road cycling club, based at Lordship Recreation Ground use the newly constructed ‘Lordship Loop’ off-road dirt track. 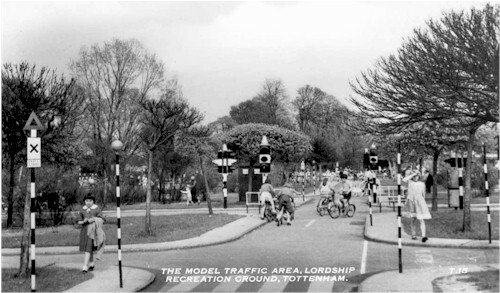 Lordship Recreation Ground Model Traffic Area, originally opened in 1938, has been recently refurbished, and is well worth a visit, for adults and children alike! It can be found in the south-west area of the park.